Football’s status as the most popular team game in the world by some margin is supported by all kinds of data from participation numbers to crowd levels to TV rights sales to the popularity of the World Cup, which is the biggest single-sport tournament in the calendar. Many nations consider football to be the national sport, and a new piece of research by sportingintelligence published today considers which football teams are not only the most popular in terms of total followers, but also in relative terms within their own countries. In order to calculate this, we used Facebook as an indicator. There can be no doubt that with one in nine of the world’s adults having a Facebook account (rising towards one in two in some major western nations), that it provides the largest pool of market research data ever known. The sports industry’s understanding of the power and importance of social networks in marketing terms is in its infancy. There are more than 500m Facebook users in the world now, and what those users do with their time online is of no small interest to researchers. Our study set out to find the most popular sports team in a selected group of countries, and to see what those findings told us about sport in those countries. The methodology was simple enough: find the number of Facebook users in each country (we considered adults, aged 18-plus), then the number of fans on specific sports teams’ Facebook pages, and then calculate what percent of a nation’s (Facebook) population followed one team. Our findings relating to nations where a football team is the most popular are published here. But in countries where a non-football team is most popular, the All Blacks rugby side of New Zealand come out on top as the most passionately supported sports team. New Zealand’s population is 4.4m people, and it has 1.5m adult Facebook users. The All Blacks fan page on Facebook has, at the time of writing, 448,000 followers, meaning the equivalent of 29.9 per cent of New Zealand are actively following. It goes without saying that many All Blacks followers will be outside New Zealand, but many, a majority, will be inside. So with this “passion rating” of 29.9 per cent, we can tentatively conclude that rugby union is New Zealand’s favourite sport, and the All Blacks the nation’s favourite team within that sport. A lot of anecdotal evidence (not to say a lot of Kiwis), would support that finding. 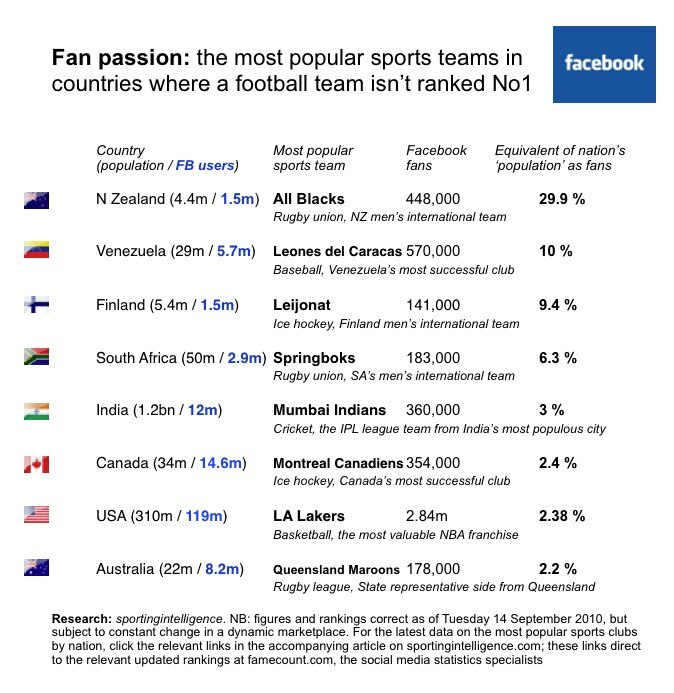 Using the same logic, baseball is huge is Venezuela, and Leones del Caracas the most popular sports team in that country, with 570,000 Facebook fans from a “Facebook population” of 5.7m, for a “passion rating” of 10 per cent. Finland’s national ice hockey team is the most loved team in that country (9.4 per cent “passion rating” among the nation’s people). As our table below suggests in some detail, the favourite sports and teams within other nations include rugby union / Springboks (South Africa), cricket / Mumbai Indians (India), ice hockey / Montreal Canadiens (Canada), basketball / Lakers (USA) and rugby league / Queensland Maroons (Australia). Social networking on the internet remains a fledgling past-time. Facebook is young but relatively mature, Twitter is younger and yet to be “mainstream” in the same way (fewer older people), although it’s heading there. This research is meant only to provide a snapshot of the situation. Looking at the Facebook users as a percentage of total populations also tells you something about a nation. India has only 12m adult account users in a population of 1.2bn people (one in a hundred people), while America, Australia and New Zealand have more than one in three. Algeria, Argentina, Australia, Brazil, Canada, Chile, Colombia, Egypt, Finland, France,Germany, Greece, India, Indonesia, Italy, Mexico, New Zealand, Portugal, Serbia, South Africa, Spain, Turkey, United Kingdom, United States, Venezuela.